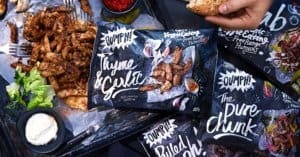 Vegan brand Oumph! is part of Swedish company Food for Progress and is a favourite in Sweden and the Nordic countries. Their meat alternative products are plant-based, free from gluten and dairy, high in protein and fibre and a source of iron and folic acid, as well has having a low climate impact. Since its launch in Sweden and the Nordic countries in 2015, Oumph! has become a favourite with a wide audience, including families, millennials, foodies, chefs and fast-food loving flexitarians and vegans. Oumph! received several awards in 2018, including:’Best Food Product of the Year’ for their Kebab Spiced at Food Matters Live; Gold ‘Food For Food Service’ for “The Chunk” at the FreeFrom Eating Out Awards; Best Vegan Meat by awarded by PETA UK at their 2018 awards for Kebab Spiced; and Bronze in ‘Ready Meals’ category for their Pulled Oumph! at the FreeFrom Food Awards 2018. Can you introduce Oumph! to our readers? Oumph! is epic veggie food from the plant kingdom. It’s made with three ingredients: soya, water and a pinch of salt. Oumph! comes in seasoned versions, such as award-winning Kebab Spiced and Pulled Oumph!, and it’s also available in unseasoned versions, such as The Chunk – where you simply add your own herbs and spices to make a range of awesome dishes. Oumph! is versatile and easy to cook. In which countries Oumph! is available? Do you have plans to expand further? Currently Oumph! is available in the freezer section in supermarkets, and on the menu in fast-food chains and restaurants, in Sweden, Norway, Finland, Denmark, Iceland, the UK and Ireland. We have expansion plans in further countries and Europe and beyond, in the next year. What differentiates Oumph! from other similar products, what is your unique selling point? Taste and texture. Oumph! tastes amazing and it has a texture that’s appealing to vegans, vegetarians, flexitarians and meat eaters. Our aim is to drive more people to eat plant-based food, which is better for the environment and the planet. Oumph! recently won Best New Food Product of the Year, awarded by Food Matters Live. Do you find the vegan food market becoming increasingly competitive? Yes, and that is a good thing. We need more and better products on the shelves in order to attract more people into the category, making it as easy as possible for people to shift towards a more plant-based and sustainable diet. The Oumph! pizza is very popular in the UK. Are you planning to introduce more varieties? 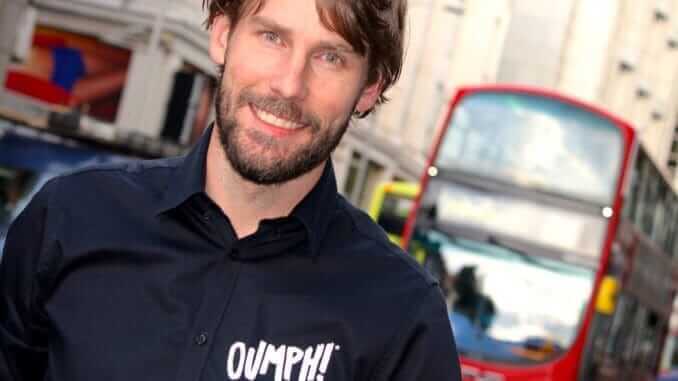 You recently launched The Oumph! Burger. Can you tell us more about that? The Oumph! Burger is a premium burger for everyone who loves burgers! When we created the Oumph! Burger, we took our inspiration from a juicy rare burger, but the difference is that the Oumph! Burger is made with entirely plant-based ingredients. Like all Oumph! products, The Oumph! Burger is made with soya beans, and the fine red colour comes from beetroot. When will The Oumph! Burger be avaliable? With more and more people reducing the consumption animal products, do you think vegan meats can replace meat products in the long term? Who knows what the future holds. What I can say is that we don’t believe this is just a trend that will blow over – it is a real change in our food consumption and behaviour, and an important step towards eating in a more sustainable way. Where do you see Oumph! in the next five years? We aim for Oumph! to get in to as many stores, restaurants, fast-food chains and food service companies as possible so give as many people as possible the opportinity to taste Oumph! and get cravings for more.